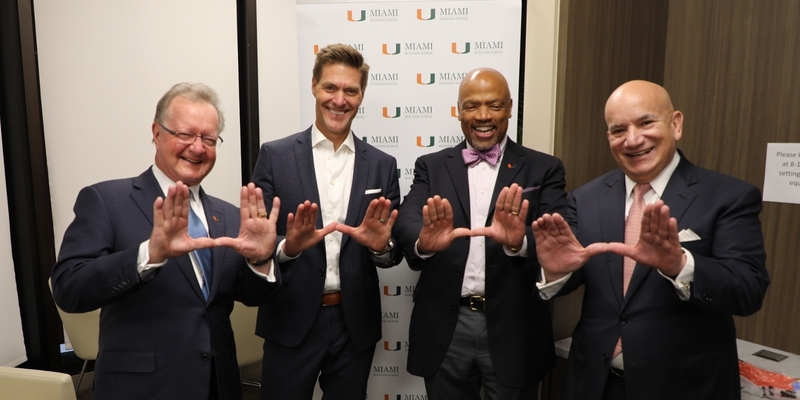 Miami Business School hosted "Making Health Care Work Better – for Everyone" featuring Steve Nelson, Chief Executive Officer at UnitedHealthcare, as part of Southern Glazer's Distinguished Leaders Lecture Series. As the leading executive of UnitheadHealthCare, Nelson oversees a $180 billion division of UnitedHealth Group. The company is #5 on the Fortune 500 list, serves 1 in 8 Americans and is the single largest business dedicated to health and well-being in the United States. During his lecture, Nelson discussed the ways in which his company and the insurance industry have recognized the need to innovate technologically. Right now, according to Nelson, Americans only receive what’s considered the “recommended care” 55 percent of the time, and 30 percent of health spending is wasted on unnecessary services and excessive administrative costs. That’s not working. Previously Nelson served as chief executive officer of UnitedHealthcare’s Medicare & Retirement business, the nation’s largest organization dedicated to seniors and Medicare beneficiaries. Other past roles include leading UnitedHealthcare’s Community & State business, an organization that delivers Medicaid solutions in 30 states and the District of Columbia, serving 6.7 million beneficiaries, and leading the West Region of UnitedHealthcare’s Employer & Individual business. Before coming to UnitedHealthcare, Steve was president of the Eastern Region and Senior Products Division at HealthNet and served for 10 years in executive roles at the Henry Ford Health System. Nelson graduated with his Bachelor of Arts degree from Portland State University and holds master’s degrees in Business Administration and Health Services Administration from the University of Michigan, where he serves as an adjunct professor in the School of Public Health. To watch the entire lecture, click here. Southern Glazer's Distinguished Leaders Lecture Series brings students, alumni and other members of the UM community together with top business leaders throughout the year. Click here to learn more.